As recently as 2016 C Major released a captivating production of Puccini La bohème directed by celebrated Italian film director Ettore Scola filmed in 2014 from Puccini Festival at Gran Teatro Giacomo Puccini di Torre del Lago, Tuscany. Now just a year later C Major release another new staging of La bohème chosen by Gianandrea Noseda music director at Teatro Regio Torino to mark the 120th anniversary of its premiere given at this very same theatre in 1896 under the young Arturo Toscanini. Noseda had the opportunity to study Puccini’s original manuscript of the score and was struck by the speed at which Puccini was clearly working. success and additional performances were added to the first run. Ollé and his design team Alfons Flores (sets) and Lluc Castells (costumes) have settled on a rather revisionary approach with a contemporary mise en scène which catches the eye especially for its modern clothing, a mishmash of styles, and its dark inner city setting. On the fringes of Parisian society in their dingy garret or more accurately bedsits (with their fronts open to the stage) the characters who don’t know where their next meal is coming from survive with their dreams of love and success and try to make light of their situation. The contemporary clothing is rather drab and unspectacular, there is a subway entrance and the occasional mobile phone adds to the present-day effect. Immediately noticeable is the black and grey construction and flickering light of the dingy tenement blocks being both characterless and cheerless, reminding me at times of the 1961 film of West Side Story directed by Wise and Robbins. I’m not sure the freezing cold winter scene is depicted as well as one might have expected and the monkeying about of the group of friends is not entirely convincing. Against the backdrop of the tenant blocks the only real bright spot is, however, Caffé Momus in the second act and its colourfully dressed staff. Unlike for example the excellent soloists Daniela Dessì (Mimì) and Fabio Armiliato (Rodolfo) from Ettore Scola’s production the performances of Irina Lungu and Giorgio Berrugi have little chemistry and don’t draw me into their relationship which felt colder than the room they were renting. Looking commonplace in jeans and jumper and slightly uncomfortable with the role Lungu’s portrayal doesn’t convincingly convey the coyness, vulnerability and melancholia which the character requires. Nevertheless, the soprano’s voice is in fine condition especially attractive, expressive and powerful with her big arias Sì, mi chiamano Mimì from act one and Donde lieta uscì from act three all suitably affecting. Nevertheless the final scene when Mimì dies is one of the least convincing I have seen. Wearing blue denim jeans and jacket with white trainers Giorgio Berrugi has an unshaven look and makes a somewhat tense if rather nondescript Rodolfo. However, his singing is reasonably assured, and I enjoyed the poet’s celebrated act one aria Che gelida manina which generates a high level of emotion together with convincing high register. Displaying appropriate flirtatiousness together with striking outfits, soprano Kelebogile Besong makes her presence felt as the singer Musetta vivaciously singing her act two aria Quando men vo ‘Musetta’s waltz’. The role of the struggling rather immature painter Marcello is taken by the tousle haired and heavily bearded baritone Massimo Cavalletti who one senses is comfortable in the role and sings competently. As the philosopher Colline with a ridiculous red wig, Gabriele Sagona reveals his richly sonorous if not especially flexible bass. Clutching his trusty light brown leather coat, he renders his final act ‘Coat aria’ Vecchia zimarra, senti with assurance. Acting believably baritone Benjamin Cho makes a breezy and kind natured musician Schaunard noticeable for his colourful attire and long thin sideboards. Certainly, Cho sings well enough to want to hear him in a larger role. Renowned in this repertoire conductor Gianandrea Noseda, in his usual spirited form, draws vibrant and consistent playing from his Teatro Regio orchestra. Impressive too are the choruses who have been clearly well prepared by chorus master Claudio Fenoglio. With stereo and surround sound options the engineering team surmount the challenges providing satisfying quality with especially good clarity and balance. Filmed in HD the picture is to a high standard despite the lighting designer keeping the background in relative darkness. Video direction by Tiziano Mancini is up to his usual high standard although it would be good to occasionally have some close ups. I always think that some footage of the audience and the pit adds to the atmosphere of a live performance. Unfortunately, there is no bonus material provided of interviews with cast members or the stage director and his creative team which could provide fascinating insights into production. In the accompanying booklet there is a listing of the cast and production teams, a synopsis, a detailed indexing of the scenes and arias together with a helpful if concise essay titled ‘120 Years of La Bohème’. 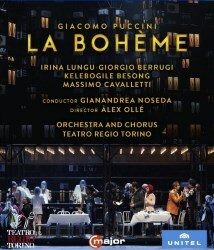 Àlex Ollé’s production of Puccini’s masterpiece La bohème isn’t one which lodged in my consciousness for too long. Overall despite some impressive singing I wasn’t entirely convinced by the acting which often felt uninspiring.